J. Palisa discovered asteroid #212 Medea. N. R. Pogson discovered asteroid #245 Vera. M. Wolf discovered asteroid #817 Annika. M. Wolf discovered asteroid #1219 Britta. A. Bohrmann discovered asteroid #2350 von Lude; and Y. Vaisala discovered asteroids #1462 Zamenhof, #1463 Nordenmarkia, #1477 Bonsdorffia and #1478 Vihuri. Y. Vaisala discovered asteroid #2479 Sodankyla. Jack Kilby of Texas Instruments filed the first patent for an integrated circuit, resulting in US Patent 3138743 A being granted 23 June 1964. The US made the first successful launch of a Titan booster, to ~300 km (~200 miles) altitude. P. Wild discovered asteroids #1803 Zwicky and #3021. USSR launched the Luna E-8-5 No.405 Moon landing mission, initially identified by NASA as Luna 1970A. The first stage failed and the spacecraft did not achieve orbit. Luna E-8-5 No.405 (or Luna Ye-8-5 No.405) was launched 6 February 1970. NASA initially designated it as Luna 1970A, and tentatively identified it as an attempted Lunar sample return, similar to the later Luna 16 mission. Subsequently released information revealed that it did indeed carry a 5,600 kg (12,300 lb) Luna E-8-5 spacecraft, intended to perform a soft landing on the Moon and return a sample to Earth. The mission failed when a defective pressure sensor caused the first stage to shut down 128 seconds after launch; the spacecraft did not reach Earth orbit. A golf ball was hit for the first time on the Moon by NASA Apollo 14 astronaut Alan Shepard. NASA's Apollo 14 Lunar Module ascent stage lifted off from the Moon, carrying astronauts Shepard and Mitchell back to orbit for their return to Earth. P. Wild discovered asteroid #2033 Basilea. Perth Observatory discovered asteroid #3301. N. Thomas discovered asteroids #2779 Mary, #2999 Dante and #3352 McAuliffe. E. Bowell discovered asteroids #3316 Herzberg and #3506 French. Starstruck, Inc., a private launch company, made the first attempted test of a sea-launch system, although the actual launch of their Dolphin rocket was aborted. Starstruck's Dolphin was a prototype vehicle built as a sounding rocket, and to develop the technology for the planned follow-on vehicle called Constellation. The Constellation rocket was to be a 4-stage vehicle able to loft a payload of approximately 3,200 lb into an elliptical geosynchronous transfer orbit. The Dolphin was a 51 ft long, 42-inch diameter recoverable booster, powered by a 35,000 lbf thrust hybrid rocket. Its payload would be 1000 lb, carried to an altitued of 125 miles. The hybrid rocket was developed and tested in Carson City, Nevada. Douglas Ordahl, the former head of hybrid propulsion at United Technologies Chemical System Division (CSD), was the bridge person from the hybrid work conducted at CSD to the work conducted at Starstruck. The launch procedure for the Dolphin was fairly straight forward. The Dolphin was filled with LOX, slid off the boat and floated horizontally in the water. A weight, attached to the aft end of the rocket, was dropped into the water and pulled the rocket upright. The nitrogen tanks were pressurized in the water, and the vehicle was ready for launch. On the first launch attempt, on 6 February 1984, travel had loosened fittings in the nitrogen system used to actuate the valves. Since the vehicle was designed for water launch, access ports were not included in the design, to reduce the number of potential water entry points. An access port had to be made at the launch site, by grinding open the intertank. As a result, a fire started on some electronic circuits. The positive spin on the event is that it demonstrated the safety of hybrid rockets - there were no secondary fires from the (solid) fuel on board. The Beagle 2 Mars lander was declared lost after over a month of silence following the landing. SpaceX successfully launched the maiden flight of their Falcon Heavy rocket, sending a Tesla Roadster into a solar orbit that will reach the asteroid belt. The Falcon Heavy became the largest operational booster by a factor of 2. At 3:45 PM EST on Tuesday 6 February 2018, SpaceX successfully launched the maiden flight of their Falcon Heavy rocket from the historic pad at Launch Complex 39A at the Kennedy Space Center, Florida. LC-39A was previously used to launch the Saturn V rockets (last flown in 1973) to the Moon and to place Skylab in orbit. The Saturn V is also the only rocket in history that could deliver more payload to orbit than Falcon Heavy. Falcon Heavy has a first stage composed of three modified Falcon 9 nine-engine cores, and a standard single-engine second stage. The center core was structurally enhanced to carry the additional thrust loads, while the two side boosters were primarily physically modified by adding attachments to the central core. All three cores also have software and control system modifications necessary for use as a multiple-core system. For reference, SpaceX states Falcon Heavy's takeoff thrust is about equal to that of eighteen 747 airliners: The 27 Merlin engines together generate more than 5 million pounds of thrust at liftoff, versus the 7.5 million pounds generated by the five F-1 engines of the Saturn V first stage. In addition, with its 27 first stage engines, Falcon Heavy has the greatest number of engines ever successfully used together: Only the Soviet N-1 launcher, with 30 engines, had more - but none of the four launch attempts of the N-1 were successful. Unable to restart all three of the engines necessary for landing, the center core of the first stage hit the Atlantic Ocean at a speed of about 300 mph. The crash, about 300 feet from the barge where it was supposed to touch down, took out two of the thrusters on the barge and showered the deck with shrapnel. The loss of the booster raises the cost of the launch, but is a relatively minor detail considering the amount of technology that did work successfully in the effort, including the near-simultaneous touchdown of the two booster rockets at Kennedy, as planned. The second failure is much less problematic, at least in immediate terms: Instead of entering a solar orbit that extends to that of Mars, the payload - Musk's red Tesla Roadster - went into an orbit that will reach into the asteroid belt. While this is seen as a good sign for parties interested in getting to the asteroid belt, it is a concern to others who want to know what the Roadster might run into: SpaceX might have just launched the car that will be involved in the first auto accident in space. 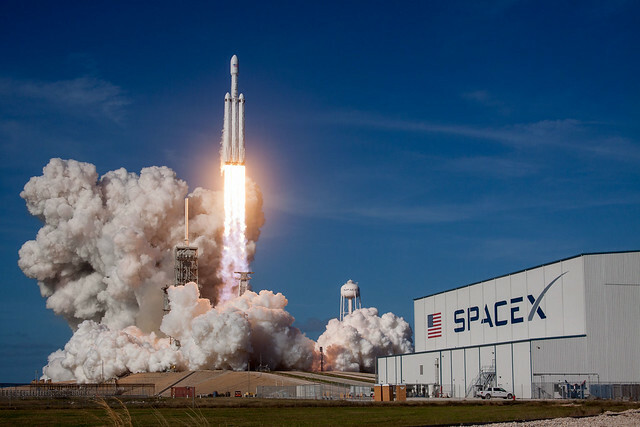 With the launch, Falcon Heavy became the most powerful operational rocket in the world by a factor of two, able to lift nearly 64 metric tons (141,000 lb) to orbit. By comparison, Falcon Heavy's capacity is a mass greater than that of a Boeing 737 carrying a full load of passengers, crew, luggage and fuel. Inception of Falcon Heavy service is an important event: Not only does it make possible launching heavier payloads than have been possible since the retirement of the Saturn V, it can also be expected to dramatically lower the cost of access to space. Together, making possible heavier payloads at lower cost should open the door to more space development opportunities - including construction of space colonies and the solar power satellite system planned by the L5 Development Group.